Appalachia & Beyond: Will the Lion Roar? This seems to be the question we ask ourselves every year around this time along with wondering what the weather will be like. If it is anything like the last couple years (and looking out the window it likely is going to be), then it really won't matter if the Lion roars or not. However if we have clear night skies and the moon is not an issue, which from what we've seen of the moon phases for the month, it shouldn't be much of a problem some time after midnight. So all we need to do is to bundle up, bring blankets and chairs, and maybe something to have a small fire. Of course, let's not forget the most important thing of all...Coffee!!! 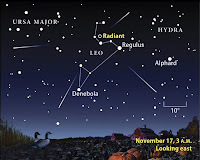 What we are talking about, in case you hadn't figured it out yet, is the Leonids meteor shower. It occurs every year around November 17 - 18, at least that's usually the peak time. 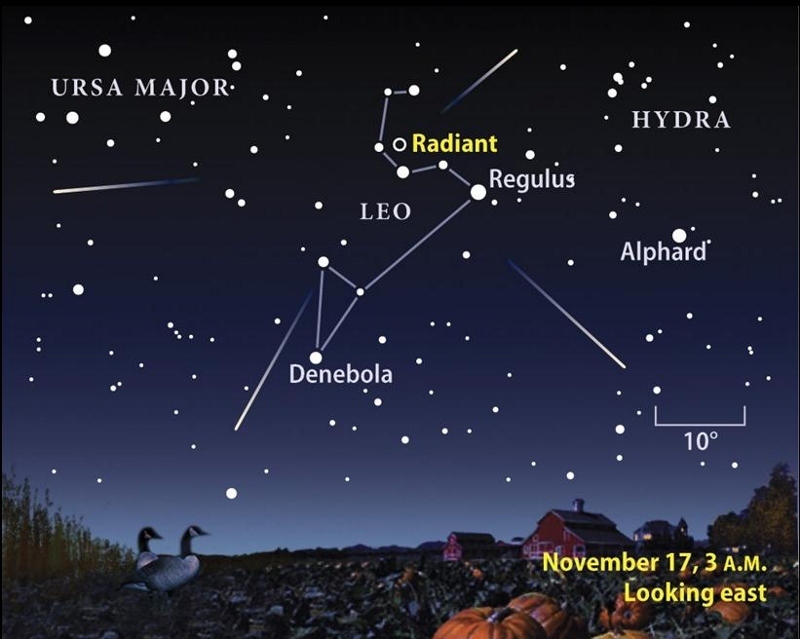 This has got to be one of our most favorite meteor showers of the year. During a storm, one can expect to see hundreds of meteors shoot across the sky every hour. During calm years, you can still catch twenty or more an hour. As we mentioned above we haven't been very fortunate enough to catch the Leonids in the past few years due to weather or moon conditions. However, this year could be promising other than it being a Wednesday and Thursday. This could potentially be a problem considering our yougin' has school in the morning and the best time for viewing the Leonids is usually well after midnight. That seems to be the issue with any major astronomical event. You see these events don't take your time into consideration; rather you must take their time into consideration and plan accordingly. So this year we aren’t totally sure if we will be able to catch the heavenly show. Just keep checking here over the next couple of weeks and you will know if we were able to make it out.